Davis Instruments introduces the all new Vantage Vue™ weather station, combining Davis’ legendary reliability and toughness into a station that’s easy to install and use. 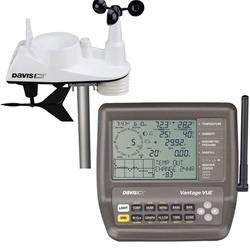 The Davis 6250M Vantage Vue wireless weather station is fully featured, highly accurate and affordably priced. It has frequency-hopping spread spectrum radio technology, wireless transmission up to 1,000 feet (300 m), weather updates every 2 ½ seconds, a glow-in-the-dark user friendly keypad, on-screen data graphing and numerous other useful features.The Davis 6250M Vantage Vue allows for Metric measurements. Made in the USA, the Vantage Vue wireless weather station includes a sleek, but tough outdoor sensor array and a distinctive LCD console. Its unique Weather Center function provides additional information on each weather variable. In addition, Davis has made the Vantage Vue radio-compatible with their flagship Vantage Pro2 weather stations so you can mix-and-match most components! The Vantage Vue wireless weather station gives you all the weather data you need. You'll see current weather conditions, including indoor and outdoor temperature and humidity, barometric pressure, wind speed and direction, dew point and rainfall. You'll also get weather forecast icons, moon phase, sunrise/sunset times, graphing of weather trends, alarms and more. The Davis 6250M Vantage Vue also boasts the innovative Weather Center button that displays additional data on weather variables for today and over the last 25 days. See updated variables every 10 seconds for heat index and wind chill to get a better “feel” for the outside environment. Domed buttons are easy to sense and press. Glow-in-the-dark keypad buttons give you access to weather information all day and all night. The Done key returns user to “current” screen from anywhere in the program. See wind speed updates every 2½ seconds. Displays wind speed in miles per hour, meters per second, kilometers per hour and knots. Provides the average and high wind speed for two-minute and ten-minute intervals. ISS Dimensions ........................................................ 12.95" x 5.75" x 13.40"
Alarm Indication: Alarms sound for only 2 minutes (except for time) if operating on battery power. Alarm message is displayed in Weather Center as long as threshold is met or exceeded. Alarms can be silenced (but not cleared) by pressing the DONE key. occur for the next 12 hours. constitutes a rain rate of zero. I had a very good experience with Tom at Scientific Sales. I placed a telephone order with him and the package was delivered to its destination in the US in one week's time. The product was delivered as promised 8 days after ordering it. It is a Christmas gift and consequently can't comment on its performance. I'm really enjoying the weather station. T.Y.